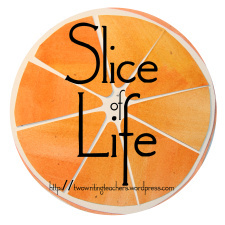 Slicing all month in March! February was a tough month. There were a lot of things bothering me. Worrying my head in the morning. Things out of my control. Confronting those things was not in my radar during February. Coincidentally or not, there is a marked difference in my attitude. I feel less agitated and more calm today than I did even yesterday. As insensitive as that may sound, there’s a big grain of truth in those words. Precisely because it’s all in my head (the good, the bad and the ugly) I can decide what piece to focus on. In February I focused on the ugly. I let the ugly take over with my students. I focused on their weaknesses rather than their strengths. I forgot myself as a teacher. I know all of this is vague. It’s muddy in my head as well. It’s so easy for me to get mired in the muck in my head. It’s so hard to find my way back.